Last day of the tour. Sunday was another short riding day for me, but very fun. 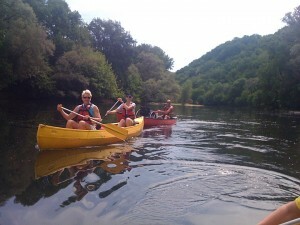 The intent was to ride from the hotel to Vitrac, about 9 km, where we would would canoe down the Dordogne to La Roque Gageac. 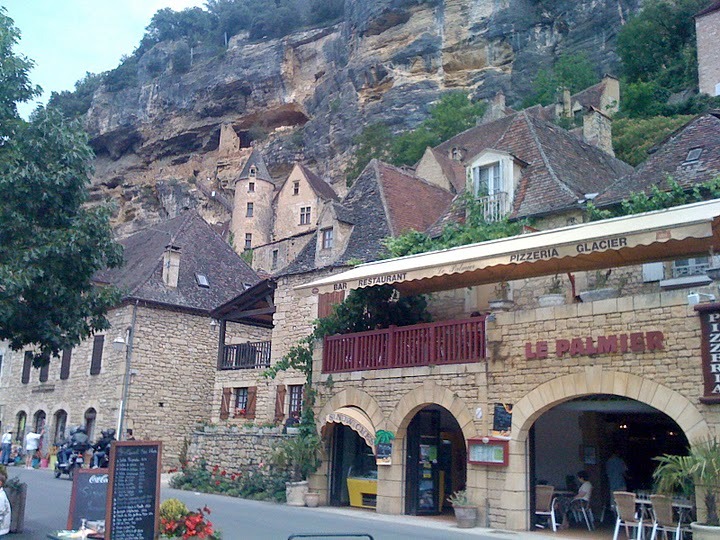 Once again I skipped the steep climb out of Sarlat by taking the van to Vitrac. 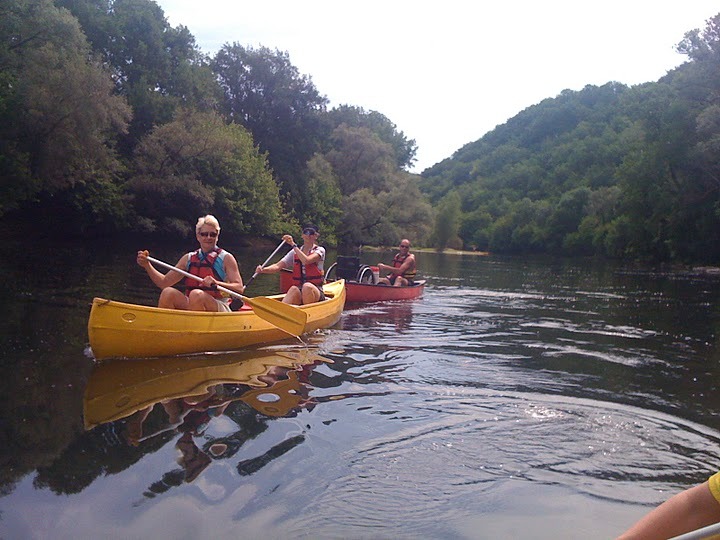 My husband and Allen weren’t interested in canoeing—too slow for them, maybe?—so it was just the women: Claudia, Rebecca, our guide Marie, and me. After a very short orientation that consisted basically of the canoe company guide Tom asking who had canoed before. We all had, so down the bank we went. I was carried by Tom and another canoe company employee. 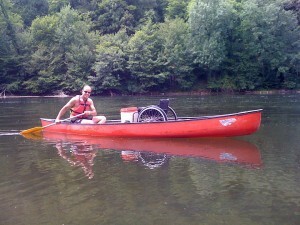 Tom took my wheelchair in his canoe. Claudia and I were together, and Rebecca and Marie had the third boat. 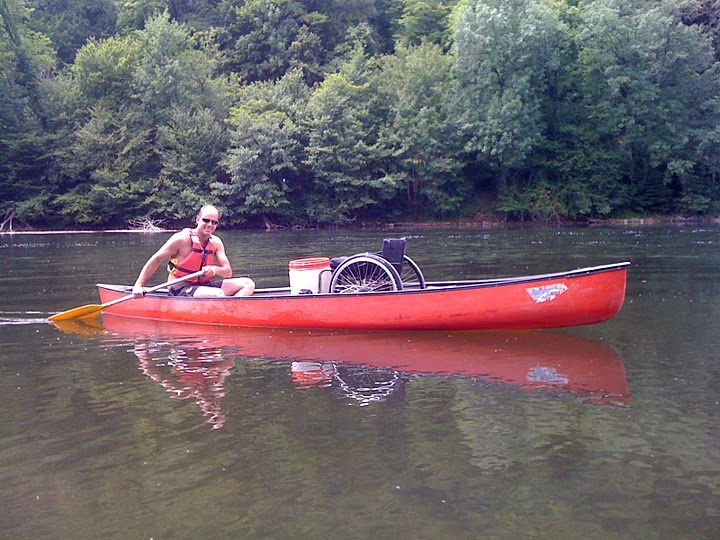 The river was broad and mostly placid, and we were headed downstream, so it was an easy and relaxing trip. Claudia in front was a strong paddler, so all I really had to do was steer. Cliffs rose on both sides, punctuated by stone bridges and fortified chateaux. We pulled in at La Roque Gageac, yet another of les plus beaux villages de France. It was clearly a big tourist attraction. We had lunch at a restaurant on the main street—it had a covered patio with tables across the street on the riverbank side. Our waiter was every inch the professional French waiter: middle-aged, slim, dark, constantly darting back and forth across the street to the restaurant. You knew that if he’d seen one tourist, he’d seen a million, yet he managed to keep from rolling his eyes at us. “Bon,” Claudia responded, and ordered ice cream with whipped cream. She turned back to me, relieved. “Hausgemacht,” she murmured, “Good”. “He knew what you were worried about,” I pointed out. After lunch it was back on the bike, heading toward the Château de Beynac. The route was up, up, and more up. Marie was with me, and Enrico was driving the van; at some point he phoned to report, thrilled, that he’d found an accessible (pay) toilet, so we met him there and used it (yea! Enrico, I owe you 50 cents). More up, up, up, with the castle somehow always in view but always further away. Enrico phoned again to confirm that the castle was utterly inaccessible, so instead of continuing up, we turned off and biked back to Sarlat. Overall, I was sorry not to have seen Beynac, or to have been able to sightsee in La Roque Gageac. 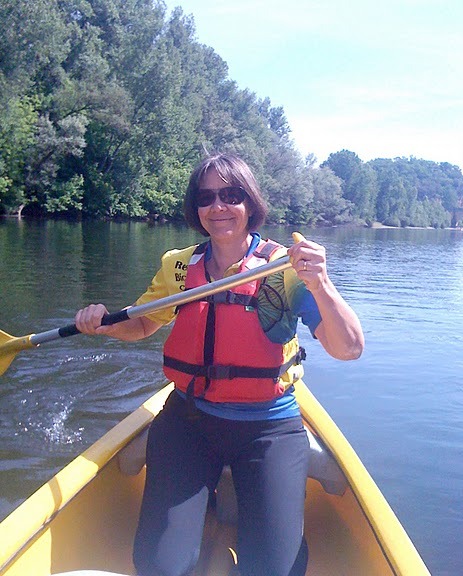 But I enjoyed the canoeing tremendously, and was glad that my ancient Girl Scout canoeing skills seemed to have survived the decades. BTW, Allen and I did go back to the same restaurant one more time (while we stayed in Domme) just for the ice cream and chantilly. 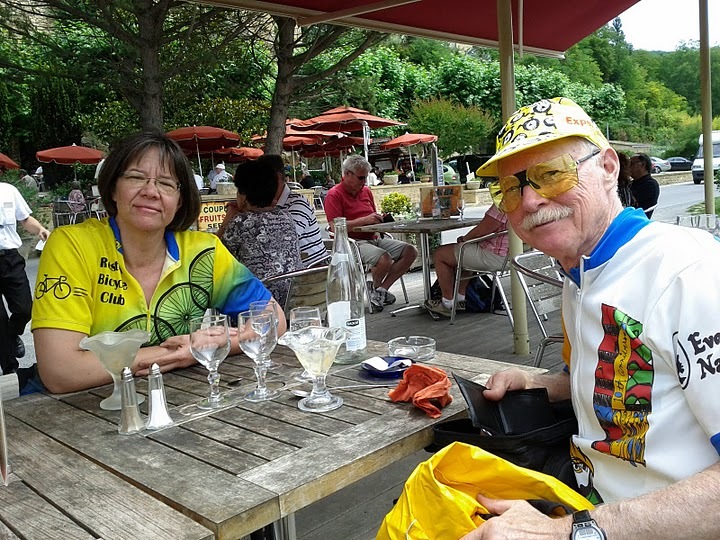 And the waiter recognized me (pretty good since I was not in biking gear that time) and I mimicked his speech of “de la maison!” We had a nice chuckle. PS – I have my priorities straight – real good whipped cream is worth it!